We are a leading Manufacturer of lobe pump, agri lobe pump, hygienic rotary lobe pumps, low shear pump, mobile rotary lobe pump and pulp waste rotary lobe pumps from Chennai, India. NETZSCH TORNADO® Lobe Pump are versatile stand-alone equipment used primarily in the Environmental, Chemical, Food and Pharmaceutical industry. These pumps handle almost any kind of substance continuously and gently, while metering in proportion to rotation speed. We are leading supplier of AgriLobe Pump. 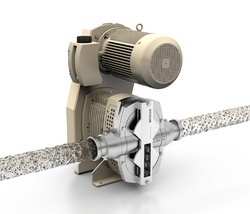 The revolutionary NETZSCH PRS (Pulsation Reduction System) guarantees an almost pulsation-free discharge that is of benefit in many process applications. Smaller overall dimensions and the innovative design concept of incorporating a timing tooth belt to both synchronise and drive means reduced space is required for both installation and in place servicing representing a cost saving in terms of site utilisation. NETZSCH TORNADO® Hygienic Rotary Lobe Pump are versatile stand-alone equipment used primarily in the Food and Pharmaceutical industry. 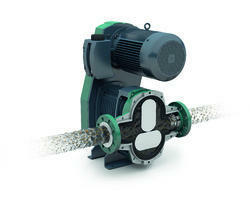 These pumps handle almost any kind of substance continuouly and gently, while metering in proportion to rotation speed. The Low Shear Pumps are designed to work with low to high lubricant fluids, low to high viscosity, shear sensitive and/or chemically aggressive media. These Low Shear Pumps are applied in various industries, the low shear pump has been used as fluid transfer pump for years. 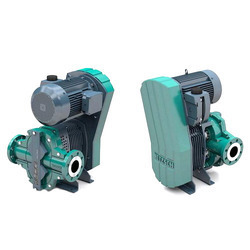 These low shear pump have the ability of pumping or transferring high and low viscosity products, with or without solids or long fibers, in suspension. Our premium quality Mobile Rotary Lobe Pump are currently in operations in countries around the world and are widely used in the Food Processing industry, Pharmaceutical industry, Refineries, Steel industry and for manufacturing cosmetics, to name a few examples. These pumps can be used in extreme conditions and require minimum maintenance. In addition to that, these pumps are suitable for handling all kinds of liquids which include oil, chemicals, and various food items. They have an excellent surface finish and come with heavy duty long lasting mechanical seals. NETZSCH TORNADO® Rotary Lobe Pump for Pulp Waste are versatile stand-alone equipment used primarily in the Food and Pharmaceutical industry. 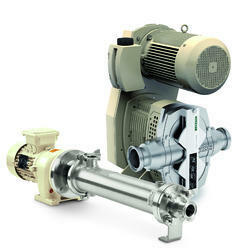 These pumps handle almost any kind of substance continuouly and gently, while metering in proportion to rotation speed. 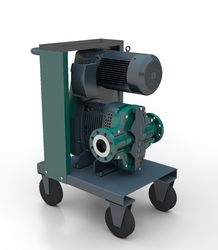 NETZSCH TORNADO® industrial Rotary Lobe Pump are versatile stand-alone equipment. Used primarily in environmental technology and the chemical industry, these pumps handle almost any substance continuously and gently while metering in proportion to rotation speed. We are the Leading manufactures of Trolley Skid Mounted Pump Unit. 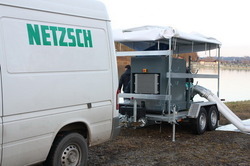 A TORNADO® Rotary Lobe Pump fastened onto a mobile base – this is the NETZSCH TORNADO® Mobile. The concept of mounting the equipment onto a car or truck trailer makes it possible to pump large quantities of fluids with solid content, wastewater and slurries at the most unusual of sites. Based on the given application, a TORNADO® rotary lobe pump is selected in the appropriate size and then simply installed onto a trailer. High capacity and low space requirements make the TORNADO® Mobile ideal for use in any disaster situation.